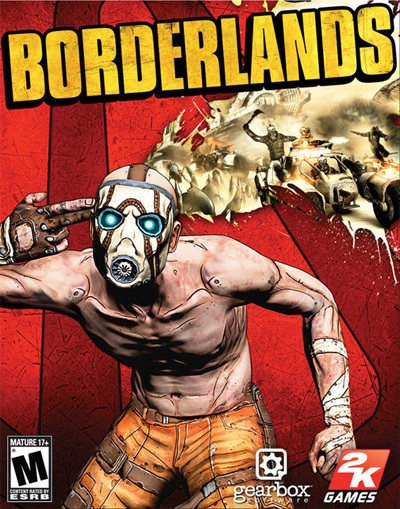 How did 2K Games get that cover for Borderlands approved by the ESRB? In psychology there’s a concept called “the contrast effect.” Basically, it means that some perception (say, weight, brightness, or sweetness) will appear greater or lesser depending on a perception that came immediately before it. Because they contrast so strongly and the memory of one affects your perception of the other. To test this out, next time you’re at the gym pick up a 15 pound weight. Then pick up a 35 pound weight. Then pick up the 15 pound weight again. Does the second 15 pound weight feel LIGHTER after holding the 35 pound one? Bam! Contrast effect. Or try noting how much more brightly colored a tie appears when paired with a white shirt than with a colored one. Bam, contrast effect again. Of course, this works for more kinds of perception than just weight or colors. It’s why you should pick your ugly, slovenly friend as a wingman next time you hit the singles bar –he just makes you look much more handsome than if you were alone. This is SCIENCE, people, and it can be used for ill or good. Wow, that’s pretty extreme. It’s got a dude holding his fingers up like a gun and pretending to literally blow his own mind with the insane action of this first person shooter-slash-loot game. Even for a title rated “M for Mature,” that’s the kind of thing that you might expect the Entertainment Software Rating Board (the ESRB, the organization that assigns content ratings to video games) to balk at. So how did 2K Games, the publishers of Borderlands, get that cover approved? I don’t have any citations, but while the story of its approval may be apocryphal, even as a thought experiment it illustrates a possible use of the contrast effect by crafty producers. Rumor has it that the current cover is really what 2K Games wanted, but they thought it might get shot down by the ESRB. Since most retailers won’t stock games without a Board rating, they wouldn’ have any choice but to capitulate. And so psychology wins the day, assuming you fancy pictures of Mad Max-style bandits glowering at you and pretending to shoot themselves in the side of the head. And assuming that this story isn’t just some video game urban legend. But even if it is, the point still stands –bam! Contrast effect! Filmmakers have been using this technique for decades to beat the MPAA and get material into their movies. Both Scorscese and Tarantino admitted to first submitting more graphic violent versions of Casino and Pulp Fiction respectively with no intention of using the actual footage in their rough cut. The films were later re-submitted to the MPAA without the graphic footage and the director’s original intent was allowed to play theatrically. Yeah, that doesn’t surprise me in the slightest. It’s an old trick and I’ll be any art form that’s subject to independent rating or regulation has had its share. I imagine this is related to how Infinity Ward got away with their infamous terrorist level in Modern Warfare 2. The scene, all by itself, is incredibly graphic, awful, incredibly realistic and interactive terrorism in a crowded airport with guns and explosives. The scene, all by itself as an entire game, would never be approved by the ESRB. Fact. It’d get a kid expelled and possibly sent to jail if he made it. If it were a downloadable program, it would be condemned by civilization. But since it’s nestled in among hundreds of other scenes where we’re patriotically shooting bad soldiers and terrorists, which is socially okay, it is approved and part of one of the bestselling games of all time. This game sits in millions of homes whose family members would be horrified to witness the scene all by itself. Thanks! Glad you’re enjoying the site so far. I’m frankly surprised at the number of people who have commented and/or e-mailed me saying that they are either psychologists or psychology students who also love gaming. Hooray for the Internet, where even the most improbable combination of interests is catered to! That’s an interesting thought, and I wouldn’t be surprised if there were something to it. Before you had explained the more graphic version of the cover was submitted before hand I had noticed a subtle contrast of my own. Now I might be going pretty far with this one but consider if the background was the tan color the blood is right now and the blood would have been red. To me I’d see the nice tan background and then all of a sudden notice the contrasting red blood, making it more noticeable and real. Having it the way it is now kind of mutes the fact that there is blood spraying out of the guy’s head. Tell me what you think? Yeah, I can definitely see that. I’m 80% sure that when a producer who worked on Borderlands, Lulu LaMer, spoke at a Montreal IGDA meeting she discussed the bait and switch of that very cover art. Ooh, neat catch. I’m going to watch this now. Haha has been 6 years. Anyway your examples sounded like more of the “Door in the face technique” than contrast effect (contrast effect might indeed be one of the reasons why door in the face works though).